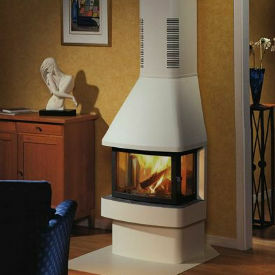 Contura / Nibe 450 range stoves in black. Great stove, this thing kicks out some serious heat. The addition of the fan for convection boost, really not worth it, unless you have a very poorly insulated house. 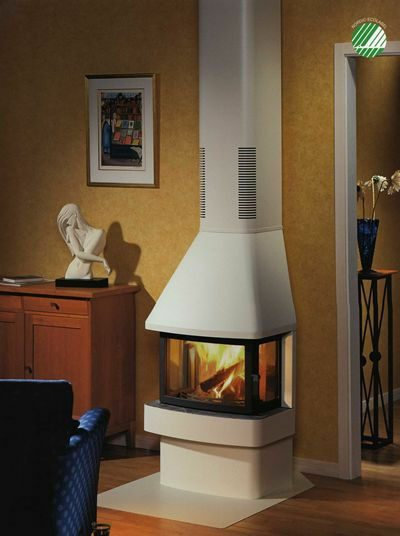 This stove is great, I would recommend it to anyone, its also quite big, we have it in where a bread oven was so its set inside the stack which is pumice lined. This means we don't need the soap stone inserts or casings, as the whole stack acts as a thermal store, for more than 24hrs (soapstone says up to 5). After a three hour burn. As a painted stove, it is worth pointing out that most of these are coated with a very high quality high temperature paint (BBQ paint), so a quick rub down on any scratches and a squirt sort out that, ours is not heat blistered, nor rusty, ALWAYS USE DRY WOOD. Bring the wood inside for minimum 24hrs to warm up (and air), as your dry wood will gather humidity by condensation in the house if it is cold, being in Scandinavia everyone knows that, not so common in the UK then people moan of sooty glass ! Stove expert replied: Please note that is you are using a pot scourer make sure it is the non stick version to prevent damaging the glass. Good review.